Choosing a dressing for a minor burn wound can be difficult, there are so many products available that are suitable, yet there is yet no scientific evidence regarding the best dressings for these injuries. Dressing choice should be informed by the key points outlines in the Dressing Selection Considerations tab. This section of the website provides some direction regarding burn dressing selection. Knowledge of the different properties of the various dressings will facilitate good decision making. The diagrams below are temporary only, and will soon be changed to an interactive decision making algorithm. Thanks for your patience whilst we complete this work. 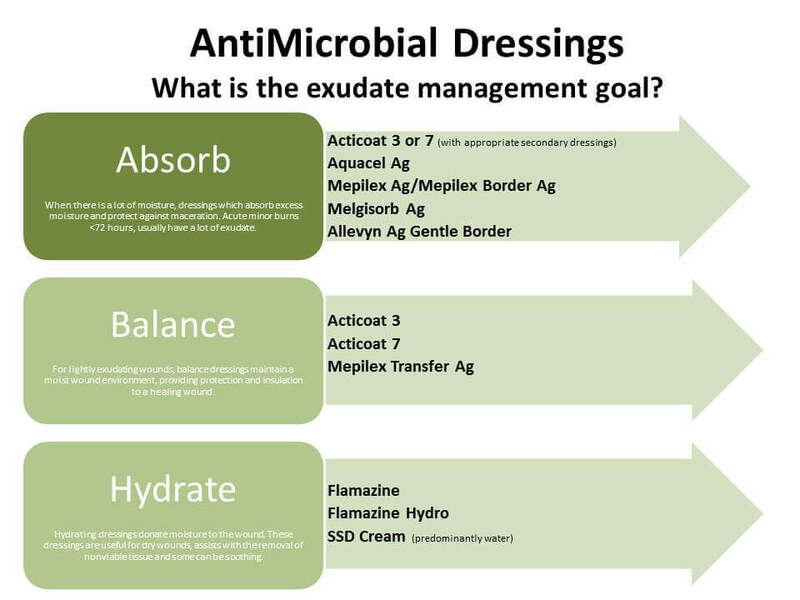 The first step is to determine whether you need a Standard Dressing or a Silver/Antimicrobial Dressing. Once this has been done, you can then select which Standard or Silver/Antimicrobial Dressing based on the moisture content of the wound. 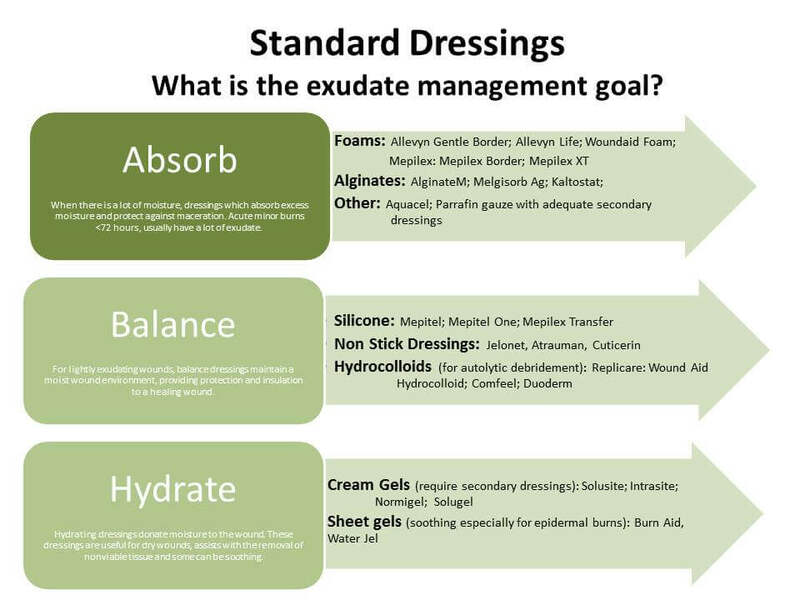 Once, it has been determined whether to use a Standard or Silver/Antimicrobial Dressing, the final dressing choice should be based on the moisture content of the wound. 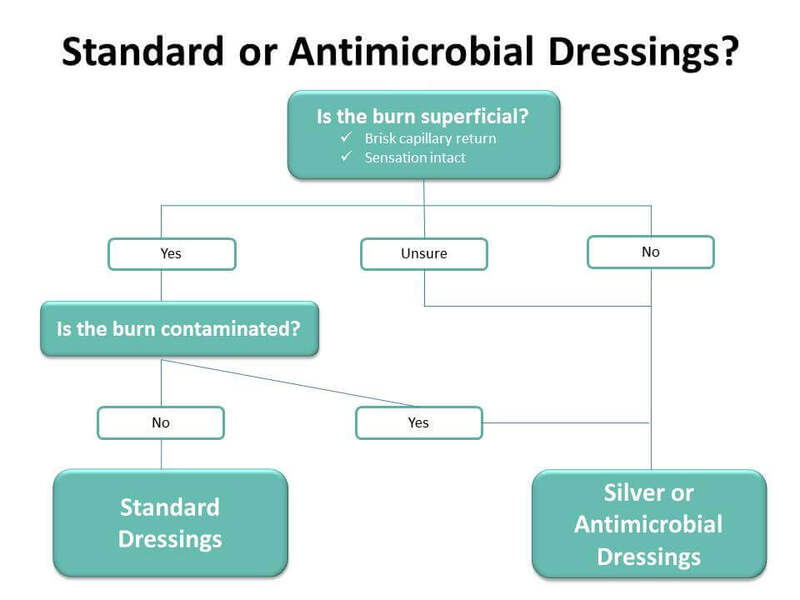 The following two diagrams provide an overview of minor burn dressing products – Standard and Silver/Antimicrobial – that are available in Australia in accordance to their moisture capacity capabilities.